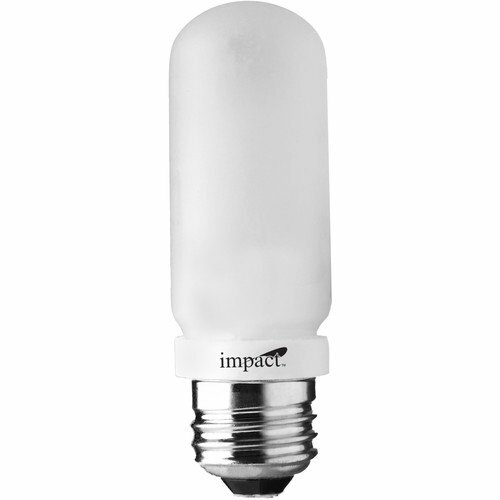 The 250W/120V JDD Lamp from Impact is mostly used by photo studios as a modeling lamp for their photographic lights, and in order to see where the light falls onto a subject. Department stores will also use this type of lamp to illuminate showcases or store displays. The universal E26 / E27 Edison medium screw base fits most monolight strobes and fixtures that accept the standard Edison base. The double envelope T10 design is made to protect the actual lighting element of the bulb from contaminates. Such as hand oil residue; which can cause a bulb to overheat and explode. The frosted glass exterior provides a softer glow; distributing an even and pleasing light onto the subject. The color temperature of the lamp is 2,900K with an approximate lumens output of 3,800, and the average estimated life of the lamp is 2,000 hours.